The Personal Management utility is represented by an icon in the notification area (system tray). Click Start > Programs > Novell SecureLogin. After you successfully launch the Novell SecureLogin, the appears in the notification area. Double-click this icon to launch the Personal Management utility. This icon is a shortcut the Novell SecureLogin functionality on your workstation. Right-click the Novell SecureLogin icon in the notification area. Select the task you want to perform. For example, select Add Applications to add, delete, and manage the applications. The following table provides the information on the tasks available in the menu. If a task does not appear in the menu, your administrator has not enabled this functionality for you. Starts the Add Applications wizard. Enables an application for single-sign on by creating a script that automates the login. Launches the Novell SecureLogin Personal Management utility. Adds login IDs (login credentials), links login IDs to applications, manages password policies, and manages Novell SecureLogin settings. Enables you to create multiple single sign-ons or login IDs for an application. For example, if you have three accounts on the same application, SecureLogin manages the three sets of credentials. SecureLogin provides the option to select the preferred account when the application starts. Opens the Personal Management utility, with the Preferences option selected. Enables you to change your passphrase question or passphrase answer. Refreshes the local cache settings and updates caches with any changes made at the associated container or organizational unit level. Backs up the Novell SecureLogin user information into a file. Restores Novell SecureLogin information from the backup file. Toggles between the online and offline states of SecureLogin. 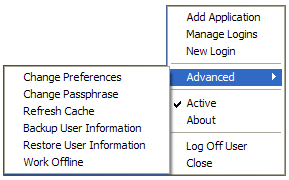 When you work offline, SecureLogin uses the local (secondary) cache rather than the directory. Determines whether SecureLogin is enabled (active) or disabled. Displays the SecureLogin version number and the status of the data stores. The primary data store is the directory. The secondary is the local cache. Enables you to shut down all programs, including SecureLogin, and log out from the workstation. Performs the same function as the Shut Down > Log Off option on the Windows Start menu.